Save !! Priced thousands under retail book value, even with the mileage ! This is a great driving Suburban, with only 2 owners and no accidents per Carfax. These trucks go a long way. Take advantage of the opportunity to buy under value now ! 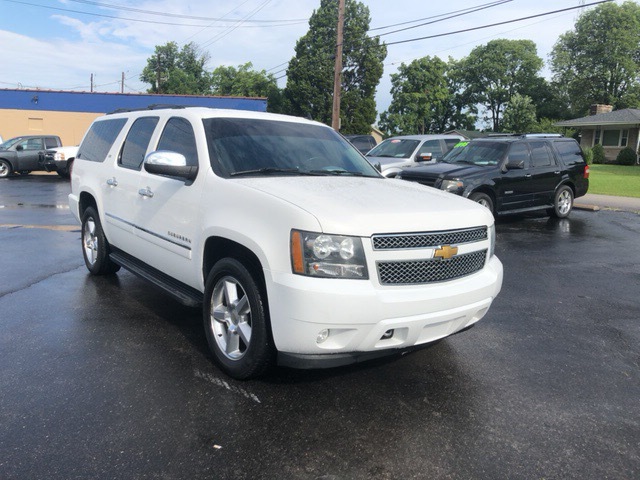 2013 CHEVROLET SUBURBAN 1500 LTZ. 6 SPEED SHIFTABLE AUTOMATIC, ON DEMAND 4 WHEEL DRIVE, AUTOMATIC LOCKING HUBS, CENTER AND REAR LOCKING DIFFERENTIAL, 15/21 MPG, RANGE IN MILES(CTY/HWY) 456/651, FUEL TANK CAPACITY 31.0 gal. FLEX FUEL/E85 UNLEADED, 5.3L V8 320hp, REAR DOOR CHILD SAFETY LOCKS, TURN SIGNAL MIRRORS, DAYTIME RUNNING LIGHTS, ENGINE IMMOBILIZER, STABILITY CONTROL, TRACTION CONTROL, TPMS, REMOTE ANTI-THEFT ALARM SYSTEM, 4 WHEEL ABS, 4 WHEEL VENTED DISC BRAKES, HEAVY DUTY TRAILERING PACKAGE, BOSE PREMIUM BRAND SPEAKERS, ELEMENT ANTENNA, AM/FM STEREO, AUXILIARY AUDIO INPUT AND USB WITH EXTERNAL MEDIA CONTROL, SEPERATE REAR AUDIO, 10 TOTAL SPEAKERS, CRUISE CONTROL, FRONT, REAR AND 3RD ROW CUP HOLDERS, CLIMATE CONTROL, REAR VIEW CAMERA, ADJUSTABLE PEDALS, REAR PARKING SENSORS, HEATED STEERING WHEEL, 1 TOUCH POWER WINDOWNS, POWER MIRRORS, REVERSE TILT DUAL MIRRORS, REMOTE KEYLESS POWER DOOR LOCKS, HEATED MIRRORS, PREMIUM LEATHER INTERIOR, DRIVER AND PASSENGER COOLED SEAT, MULTI LEVEL HEATING DRIVER AND PASSENGER SEAT, DRIVER SEAT POWER ADJUSTABLE LUMBAR SUPPORT, 8 WAY POWER DRIVER SEAT, MAXIMUM TOWING CAPACITY 8000lbs., ALLOY WHEELS, FRONT INDEPENDENT SUSPENSION, FRONT AND REAR STABILIZER BAR.